Founded in 1966 COBA Plastics specialises in the extrusion of thermoplastic tubes and profiles in a wide range of materials. Based in Fleckney, Leicestershire, COBA’s global Headquarters, encompassing a state-of-the-art design and manufacturing facility, employs more than 300 people. Reflecting the company’s global reach, COBA operates several overseas manufacturing sites. To ensure the delivery of high quality parts, on time and at the right price, COBA provides its customers with an all-embracing range of services and capabilities. In addition to an advanced in-house design provision, the company offers full project management services. The delivery of high quality products and services at a cost effective price has been the basis of COBA’s remarkable success. The company’s relentless pursuit of quality is reflected in its continuing investments in the best available inspection aids. COBA Plastics, Quality Manager Gary Wyatt explained; “As we manufacture for some of the most demanding domestic and overseas industrial sectors, including the Automotive, Medical, Construction and Packaging industries, and given the fact that we ship over 20 million parts every month to more than 50 countries, we adhere strictly to world-class quality standards. “COBA manufactures an extensive range of standard and bespoke thermoplastic components for the global automotive industry, including finishers, safety systems, washer systems, under-bonnet seals and door seals. In fact, the vast majority of the cars currently on European roads contain parts made by COBA. “The high volume of automotive parts passing through our busy Quality Control Department recently prompted a search for an accurate 2D coordinate measuring device that would deliver both the required precision and speed of operation. As our parts are deformable, the proposed equipment needed to make its measurements in a non-contact method. “Having looked at several alternatives, we considered that the VuMaster from Baty International was the ideal measuring system for our specific needs. Unlike alternative non-contact measuring systems, the VuMaster’s camera moves whilst the part remains still, meaning that more often than not we do not need to use time consuming work holding methods. Speed of operation is also helped by Baty’s easy to use software and the system’s intuitive controls. “Now fully operational, in addition to the VuMaster’s speed and ease of use, it is also delivering the required level of accuracy. Although we usually measure single parts, as the VuMaster has a large component support, we are also able to load and measure multiple parts. As we have already generated a lot of part programs, including nominal dimensions and upper and lower tolerance limits, we are able to load parts, recall the relevant program and undertake rapid, accurate measuring routines. If required we are then able to generate a comprehensive report in the form of a fully dimensioned drawing of the measured part. 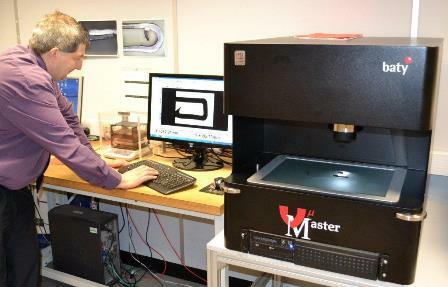 “Through the system’s great speed and accuracy, Baty’s VuMaster has made a significant contribution to our pursuit of total quality.” Burgess Hill, West Sussex based Baty International is one of the world's leading manufacturers of high quality Optical Profile Projectors, Co-ordinate Measuring Systems and Gauging Products. Building on decades of experience in non contact dimensional measurement, Baty International has offered advanced camera based, vision measuring systems since the early 1980s. Due to the use of a patented Colourmap™ scale system, the VuMaster is a manual 2D vision system with a massive difference. The Baty 2D measuring device does not have a conventional stage or encoders – instead the innovative system benefits from the use of a high resolution ‘floating' measuring camera that is able to move anywhere within the VuMaster’s application range. This arrangement results in a fast, accurate, ‘non contact’ measurement system with a generous application range of 400mm x 300mm. As the VuMaster’s hi-resolution camera moves, whilst the part remains static, there is often no need for the use of expensive and time consuming work holding devices. VuMaster can be operated manually or inspection routines can be easily recorded and stored for future use. When recalled, the stored ‘programs’ are able to guide the operator through pre-defined inspection procedures, whilst recreating the original lighting conditions and using ‘Video Edge Detection’ to automatically ’capture’ feature data. If required, complete reports can be generated in the form of fully dimensioned drawings of the measured parts. For more information about Baty's VuMaster click here.